A MindSet represents the way our brains are prepared to accept and process information – encompassing attitudes, skill sets, interaction styles, and decision-making processes. A leader’s MindSets guide their initial reaction to an event or situation as well as their longer-term effort to provide effective leadership; a leader’s success is largely determined by the quality of his or her MindSets. Efficient MindSets serve as well-prescribed glasses, converting into sharp focus what others see as only as hazy motion; or as a telescope, enabling a leader to discern more distant pathways to success that that fall beyond the vision of others. For a leader, optimal MindSets ease stress as they boost competence and confidence. For a business, optimal MindSets provide a template for a healthier culture, better employees, superior products and services, improved customer satisfaction, enhanced reputation, and ultimately – business dominance. MindSet examines the outlooks, insights, and skill sets that have demonstrated the power to attract, build, and retain employees who will engender and protect unusually positive and success-oriented work cultures. 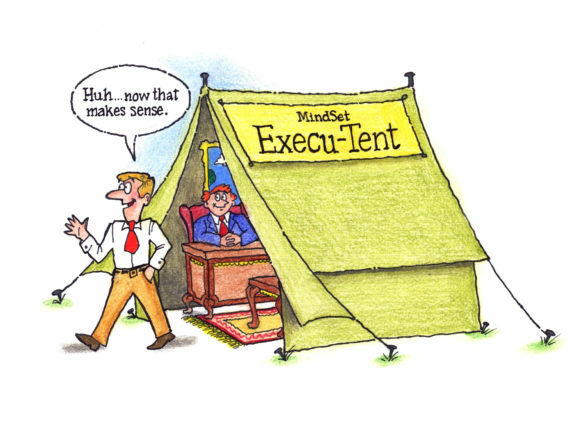 The MindSets are applied, functional, time-tested, and learnable; leaders who absorb them will possess an analytical structure that will allow them to better navigate through the myriad of complex social, emotional, financial, and strategic decisions that are necessary to move an enterprise toward greater success.